This is my very last minute "maybe I should do something" entry. Since I really only knit and do photography, I was a little limited (especially due to my lateness). I grew up in a small town in Northeast Alabama named Scottsboro. Most people have never heard of it, but if they have, it is for one of three reasons: the Scottsboro Boys case, Unclaimed Baggage, or the snake handling crazy church (which was actually not "technically" in Scottsboro). 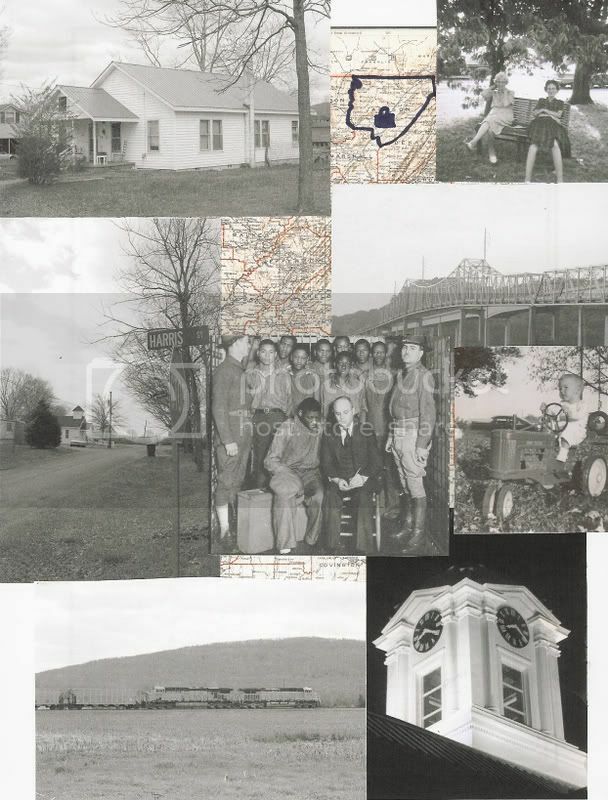 If you want to know the history of Scottsboro, feel free to look it up on Wikipedia; it has a lot of great information thanks to the local historians. Obviously, my family in Scottsboro is important to me; I love hearing stories, especially from my grandmother, about the "old days." You may wonder why I would include the Scottsboro Boys. It was a terrible incident where race was used to wrongly convict innocent people. As a forensic scientist, I strive to find the truth in a case. There can be no bias or prejudice against the accused. When I lived in Sboro, it didn't really mean anything to me, but it now serves as a reminder to why I became a forensic scientist. Oh yeah...I tried to make the "dot" for the city into a suitcase....didn't really work, did it? The outlined county is Jackson County. Cool photos. It's neat to have all that family history in one place. I think I have become addicted to quilting. Attention swap partners! My blog and flickr have spoilers! That's wonderful. I love the collage and combining memories and history into crafts. I bet you local library or museum would love to display it if you were willing to part with it for a time! Also, so cool you are a forensic scientist! I've only seen them on TV!